April 2019 – Rachael and James visit Nacho Bartomeus’ lab in Sevilla, Spain to kick off the new Belmont BioDIVERSA grant. The research group (above); Nacho Bartomeus and David Kleijn finding 7 genera of bees in one patch of Anchusa (below). Congratulations to Colleen Smith whose paper on pollen foraging by native bees was accepted at Journal of Animal Ecology! Congratulations to Casey Hamilton for winning the Peter Smouse Graduating Senior Award from the Department of Ecology, Evolution, and Natural Resources! January 2019 – a Belmont / NSF grant led by former lab postdoc Nacho Bartomeus (Spain) is funded, with Rachael as the lead PI for the USA. Rachael is on the list of Global Highly Cited Researchers for 2018. December 2018, postdoc Mark Genung departs to found his own lab as Assistant Professor in the Department of Biology, University of Lousiana, Lafayette. Congratulations Mark !!! We miss you! Rachael joins the board of scientific advisors for Duke Farms, an environmental stewardship center supported by the Doris Duke Charitable Foundation. Ph.D student Colleen Smith gives a talk on patterns of forest bee biodiversity at the Entomological Society of America Meeting in Vancouver, BC, Canada, on November 13, 2018. Congratulations to incoming Ph.D student Dylan Simpson for successfully defending his M.S thesis at College of William & Mary, September 2018! Rachael reviewed Thor Hanson’s Buzz for Science, July 2018. Ph.D student Lucia Weinman and field crew begin research on plant-pollinator networks in national parks of the Great Lakes region. Check out one of their island campsites at left. The lab’s research is featured on the NSF BIO/DEB web site, July 2018. Tina Harrison has her paper on biotic homogenization in bee communities accepted at Global Ecology and Biogeography, June 2018. Neal Williams, a co-PI on the lab’s NSF grant, visited the lab from 25-29 May 2018. Great to get his advice on experimental floral ecology and other lab projects! Lab undergraduates Kiara Londono and Casey Hamilton, and a short-term postdoc, will work with Mark and Rachael on the NSF grant measuring the biodiversity-ecosystem function relationship at large spatial scales, thanks to supplemental REU and CLB grants from NSF. Lab paper, with a perspective by Claire Kremen, published in Science! Rachael is on the 2017 list of highly cited researchers which sorts authors according to how many of their papers were in the top 1% for citations during the past decade. Interesting that out of 160 researchers worldwide who made the list for Ecology & Environment, only 21 were women. Congratulations to Dr. Bethanne Bruninga-Socolar on the successful defense of her Ph.D dissertation and also on the newly eclosed bee! Rachael attends workshop on bees and math at Fields Institute, Toronto, February 26-28, 2018. Dylan Simpson will join the lab as a Ph.D student in fall 2018. Dylan is currently completing his MS at the College of William & Mary. He will be funded by a Rutgers Excellence Fellowship as well as a EOAS Fellowship. Tina Harrison leaves for a postdoc position in Neal Williams’ lab at UC Davis, January 2018. We’ll miss you Tina! Finishing Ph.D student Bethanne Albert-Bruninga accepts a postdoc position at University of Minnesota, January 2018. Postdoc Tina Harrison has papers accepted in Global Change Biology and Landscape Ecology, Oct/Nov 2017. Rachael participates in a great workshop on temporal networks in Freiburg, Germany, led by Diego Vasquez and Tiffany Knight. Winfree lab traveled to Portland, OR for the Ecological Society of America meeting this August! Rachael, postdocs Mark Genung and Tina Harrison, Ph.D students Bethanne Bruninga-Socolar, Colleeen Smith, and Michael Roswell, and lab alum Dan Cariveau all presented talks. Long-term research tech Erin Lowe heads to Claudio Gratton’s lab at University of Wisconsin for grad school, August 2017. Rachael was promoted to full professor, July 2017. Scott Black (in black), Executive Director of the Xerces Society for Invertebrate Conservation, visits the lab to talk about a vision for pollinator conservation in the northeastern USA, 13 July 2017. Alex Matthews joined the lab on 30 May 2017 as an undergraduate researcher funded by an NSF REU. Alex will research the per-visit pollination efficiency of wild bee species across multiple native plants. Congratulations to lab undergraduate researcher Rosy Tucker, who won the Buell Award for the top graduating senior in Ecology, and gave an outstanding presentation on her senior honors thesis in May 2017. Lab undergrad Rosy Tucker’s presented at the International Association of Landscape Ecology Meeting in Baltimore on 12 April 2017. Lab postdoc Mark Genung’s paper using the Price equation to analyze the temporal variance of pollination services accepted at Ecology. The lab’s 2017 NSF REU supplement proposal was funded! Postdocs Mark Genung and James Reilly will present at the International Congress of Entomology in Orlando, 25-30 September 2016. Congratulations Dr. Tina Harrison, 12 September 2016! PhD student Bethanne presents a poster on the role of floral density in determining bee foraging behavior at the ESA meeting in Ft Lauderdale August 8-12 2016, and visiting PhD student Jamie Stavert, who left his native New Zealand to spend two weeks with us, gives a talk on how functional diversity within pollinators affects their responses to land use intensification. Rachael gave a keynote address ‘What can pollinators tell us about biodiversity and ecosystem services in real-world landscapes?’ at the third international conference on pollinator biology, health and policy at Penn State University on 19 July 2016. MS graduate Sean Griffin and PhD student Bethanne Bruninga-Socolar’s paper on native bee communities in restored prairies will be published in Restoration Ecology! PhD graduate Molly MacLeod and postdoc Mark Genung’s paper on ‘rewiring’ in plant-pollinator networks will be published in Ecology! Congratulations to lab undergraduate researchers who were senior graduation award winners from the Department of Ecology, Evolution and Natural Resources! Joe Zientek received the Roger Locandro Award in Natural Resources, and Tiffany Bennett received the E B Moore Foresty Award, May 2016. PhD student Tina Harrison and undergraduate researcher Rosy Tucker give a talk on their rare bee research at the US Regional Meeting of the International Association for Landscape Ecology in Asheville, NC in April, 2016. Kleijn, Winfree 2015 paper in Nature Communications was featured in the British Ecological Society annual ‘12 Months in Ecology‘ lecture on highlights of the year. Rachael becomes an Associate Editor of Global Ecology and Biogeograghy, starting June 2016. Rachael joins the Board of Directors for the Xerces Society for Invertebrate Conservation, December 2015. Rachael makes the Thomson Reuters list of highly cited researchers for the period 2003-2013, as of December 2015 (highlycited.com). Not entirely sure what this means, but maybe it means something? Another research highlight in Nature – this one for a PNAS paper on pollination by flies and other non-bee insects, led by two former Winfree lab postdocs, Romina Rader and Nacho Bartomeus. Former graduate student Sean Griffin and Rachael are co-authors. Lab postdoc Mark Genung and graduate students Tina Harrison and Michael Roswell presented at ESA in Baltimore, August 2015. New Nature Communications paper featured in The Washington Post, The Guardian, LA Times, The Independent, Wired, Quartz, Conservation Magazine and Science Daily. 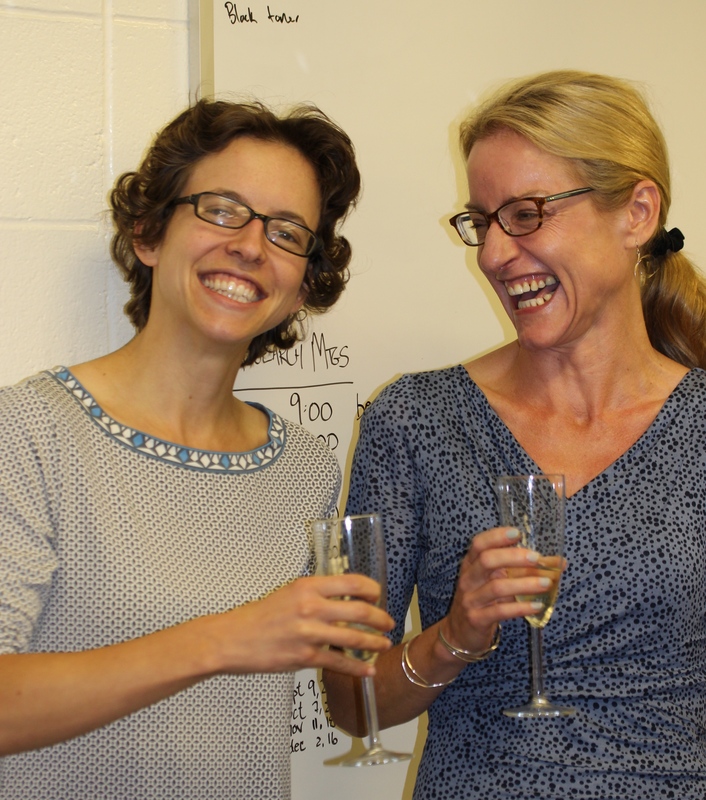 Congratulations to Dr. Faye Benjamin and Dr. Molly MacLeod, May-June 2015! New Ecology Letters paper from Winfree et al. highlighted in Nature! Congratulations to postdoc Dan Cariveau who will be starting an Assistant Professor position in the Department of Entomology at the University of Minnesota on August 31 2105! Research by undergraduate students Rosy Tucker and Kurtis Himmler featured in the Rutgers student newspaper. Lab postdoc Mark Genung presented at the joint BES-SFE Meeting in Lille, France, and at Doñana Research station in Seville, Spain, December 2014. (Below) Mark and postdoc emeritus Nacho Bartomeus talking science in front of the 1920s Iberoamerican exposition building. Carl Zimmer’s 25 November 2014 New York Times article discusses Nacho Bartomeus’s PNAS paper. Dan Cariveau and Tina Harrison presented at the Entomological Society of America meeting in Portland, November 2014. Seven Winfree lab members plus postdoc emeritus Nacho Bartomeus head to Sacramento to present at ESA, August 2014. ESA highlights our talk on bee tongue length allometry. See other Winfree lab talks from ESA 2014 here. Postdoc Dan Cariveau advises New Jersey State Legislature committee on native pollinator bills, June 2014. Congratulations to Ph.D student Molly MacLeod for being awarded an EPA STAR Fellowship, May 2014, and to incoming Ph.D student Michael Roswell for being awarded an NSF Graduate Research Fellowship, April 2014!